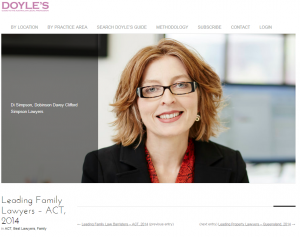 Canberra’s specialist family law firm, Dobinson Davey Clifford Simpson (DDCS), has just been announced as the leading family lawyers in the ACT for 2014 by the prestigious Doyle’s Guide. ely short time as a family law firm over the past seven years,” said DDCS Managing Partner, Julie Dobinson. “We are proud that we have been independently recognised as the leading family lawyers in the ACT for 2014. It’s very gratifying for the firm and our lawyers,” Julie continued. DDCS are local Canberra family law specialists assisting clients in Canberra and rural NSW in dealing with issues around property, children and litigation. The firm also offers specialist advice in wills and estate planning, business succession and tax issues. The Doyle’s Guide offers a guide to the Australian legal profession. It provides an editorial listing of the leading lawyers, barristers and law firms from all states and territories. Doyle’s promote their guide as a resource for individuals, corporates and government to find the right lawyer for their specific needs. Doyle’s compiles their list of category winners on the back of extensive telephone and face to face interviews with clients, peers and relevant industry bodies. All research is focused on Australian based clients and practitioners. “We are also thrilled that Doyle’s Guide has also recognised our very talented lawyers by awarding individual accolades to each of the firm’s four partners,” said Julie. DDCS partner Di Simpson has been listed as a market leader in family law. Julie Dobinson and Lois Clifford are noted as preeminent family lawyers, and Phillip Davey is recognised as a leading family lawyer. “Each of the four partners and eight employed lawyers at DDCS has different strengths and styles that work very well together. We’re all about positive energy and we respect the individual talents and strengths of each other. It’s reflected in our culture and the service we provide to all clients. “We are thrilled with this listing and look forward to continuing to help people of the ACT and surrounds in dealing with difficult times in their lives such as separation and divorce, parenting matters and managing their property and finances,” Julie concluded.